Weather forecasters require free Weather Icons just like designers and app developers need them. You might want to take advantage of their diverse nature to plan for different seasons. This is because some of them come as stickers. Thus, you can fit them in your calendar, journal or notebook. They simply allow you to express different conditions in the simplest way. They depict every form of meteorological conditions. Purchase and download the set of Website Icons containing weather symbols in a ready to use format for apps. The AI, PSD, and SVG graphic files feature glyph icons for summer, spring, and winter. The set of Vector Map Icons containing the moon, the sun, and rain come in AI, EPS, JPG, and EPS 8 file formats for editing using Adobe CS1+. They are licensed for purchase. 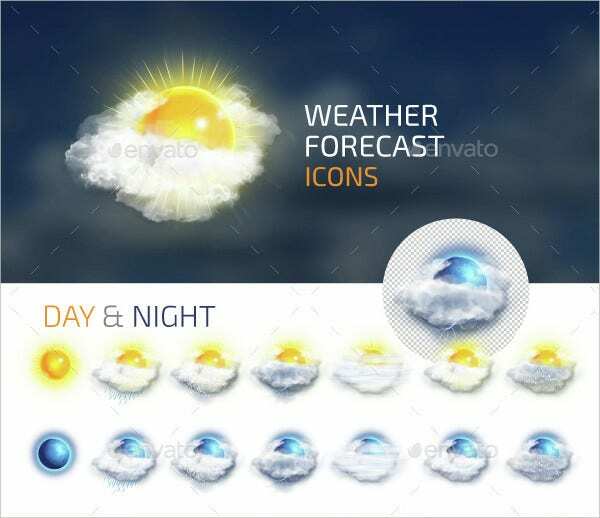 Download the set of realistic weather calendar icons in cartoon style. The Flat Vector Icons featuring girly drawings on a blue background come in JPG format and require Adobe CS1+ for modification. Download the collection of 60 simple vector map icons in AI, PDF, CSH, SVG, and PNG formats for app developers and designers. The icons portray different seasons including summer, winter, and spring. The assortment of 20 free icons displaying different kinds of weather suits websites and mobile devices. The vector graphic files for editing and customization feature diverse sizes and high resolution. Inspire your girl child to study and appreciate different weather conditions using the set of calendar icons that comes on a light blue background. They layered JPG graphics depend on Adobe CS1+. Get ready for different seasons and weather conditions using the set of mini website icons. You can color the handmade stickers for journal pages & notebooks since they are easily editable and customizable. The Set of free icons at a high resolution in vector format comes with a patterned background. It features stars, snowflakes, storm, wind, lightning, clouds, raindrops, and sun symbol in a simple format. Enjoy using the set of free icons for commercial and private purposes. The 20-rounded weather icons are scalable and ready to use in AI, EPS, PNG, SVG, and PNG formats containing free future updates. Purchase the set of 90 weather icons stickers that comes on matte paper. The handmade website icons are also available in glossy paper featuring different colors. They are made using ink. Weather forecasters require this collection of 125+ Weather Vector Map Icons containing a PNG transparent background. They come in a square format measuring 2000 pixels at high resolutions containing broadcast tools. Download the set of mega pack weather icons available in different colors on a beautifully colored background. The vector illustrations of different sizes at high resolution are ready for use and editable. Purchase the simple yet stylish set of 15 Weather line Calendar Icons featuring snow, temperature, wind, thunder, sun, and rain. They suit diverse projects in PSD, EPS, SVG, and PNG formats. The assortment of website icons in a flat thin line layout contains AI, PDF, EPS, CSH, PNG, PSD, and SVG files on a blue background. They are layered and available at high resolution and require Adobe CS1+. The set of hand drawn weather icons prides in its originality. The website icons on glossy paper enable you to plan for each day depending on the weather free of cost. Finally, you should attempt using the collection of Weather Icons in your personal and commercial projects. The realistic symbols of different weather conditions are easy to modify and customize. They suit websites, blogs, prints, and calendars. Interestingly, they come in a wide range of colors, sizes, and shapes to appeal to kids and adults.